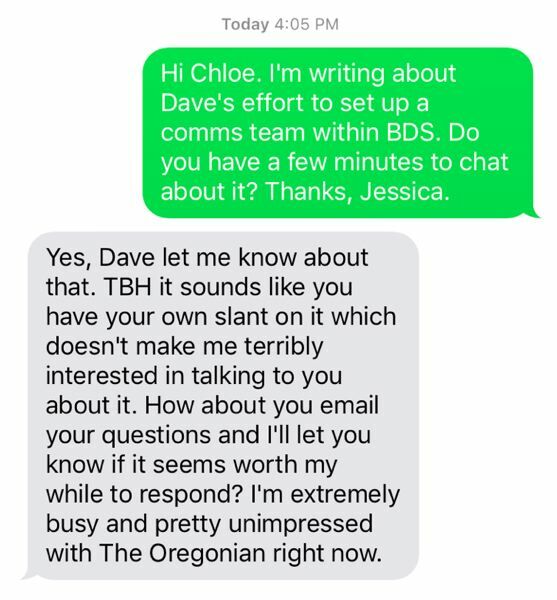 The Oregonian responds to Commissioner Chloe Eudaly complaints against local journalists in posts that she thought were private. Portland journalists, politicians and government insiders were all atwitter over Veterans Day weekend when freelance journalist Mike Bivins posted screen shots of city Commissioner Chloe Eudaly complaining about local journalists and constituents on Facebook. At least some of the drama — against the backdrop of a story on a significant boost in spending on communications staff in the Bureau of Development Services— played out in full public view on Twitter. Journalists, politicians and others retweeted and responded with their own accusations and assertions of the propriety of the comments or of posting speech Eudaly thought was private. Eudaly even posted on Facebook behind her privacy settings about the Twitter outrage, which was also screen-captured and posted by Bivins. The Poynter Institute Vice President Kelly McBride is a leading authority on media ethics and said this is more than just a spat between a journalist and a politician: "It's a broader story about this particular political figure's ability to be honest. Politicians that can't tell the truth should be held accountable." McBride further added that she has seen a national uptick in stories of local politicians being sharply critical of the media. "Anecdotally, …it seems like many local politicians have taken up the strategy of attacking the media," she said. McBride added that it would be logical to attribute the increased incidents to President Donald Trump's frequent and candid criticisms of the media, but stressed that she has no scientific evidence to support that claim. Eudaly is not a fan of Trump. In one of her Facebook posts Bivins posted, she called him and former Arizona Sheriff Joe Arpaio "trash humans." Eudaly originally posted the comments so that they are only visible to her friend network. Bivins, who recently graduated Portland State University and is known in the area for his Twitter coverage of political protests, said he friended Eudaly on Facebook after she followed him on Twitter in February. "We've never spoken or interacted that I'm aware of," he said. Bivins said he was initially conflicted about whether to post the screen captures, but after visiting her wall and seeing many posts regarding reporters and even some constituents, "I just let my conscience guide me." The thread with about 20 screenshots of various incendiary statements has gotten tens of thousands of views, according to Bivins' Twitter analytics, which he shared with the Tribune. It all started on the evening of Nov. 10. "I click into Facebook and I see this post from Eudaly where she's just eviscerating this Oregonian reporter and I was just like: 'Whoa, this is out of line. This is not acceptable,'" Bivins said. 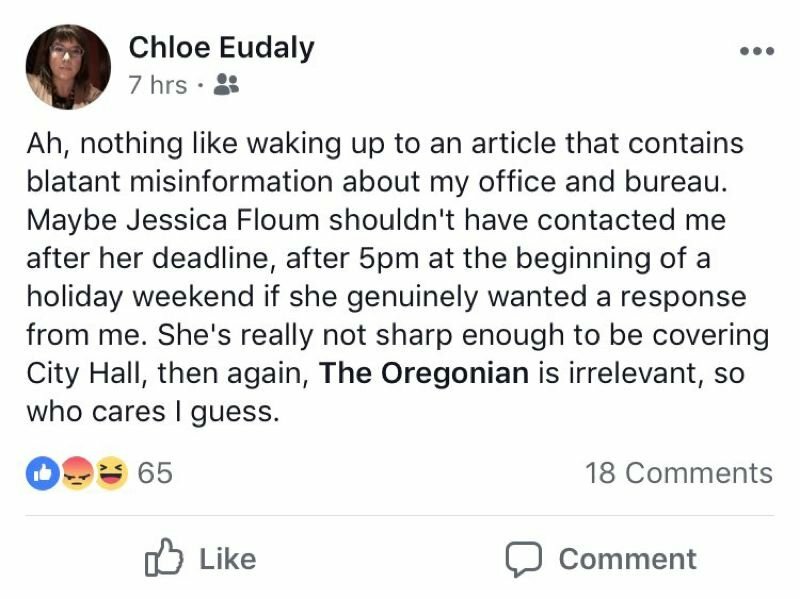 In Bivins' picture of the post with, at that point, 65 reactions, Eudaly accused The Oregonian's City Hall reporter Jessica Floum of not genuinely wanting to contact her because she reached out "after her deadline, after 5 p.m. at the beginning of a holiday weekend." "Yes, Dave let me know about that. (To be honest) it sounds like you have your own slant on it which doesn't make me terribly interested in talking to you about it. How about you email your questions and I'll let you know if it seems worth my while to respond? I'm extremely busy and pretty unimpressed with The Oregonian right now." Austin defended the commissioner by saying that Floum's report contained major inaccuracies. There are four corrections at the end of Floum's online story. "There were some minor errors, which are obviously regrettable," Floum said. "Accuracy is of paramount importance to me and The Oregonian and that's why we issued the corrections." Floum, a professional reporter since 2014, started at The Oregonian soon after Eudaly was elected to the post last November. Betsy Hammond is Floum's editor and said she stands by her work "100 percent." Hammond added that accuracy is their top priority and the errors were regrettable. "Whether those materially affected the lead and the reader takeaway from that article, I think you can see the answer is no," she said. Eudaly posted on Twitter Nov. 11 that she was still dissatisfied with The Oregonian's correction and reiterated that she was contacted after 5 p.m. The Tribune contacted Eudaly's Chief of Staff Marshall Runkel on Tuesday, who deferred future comment, but did not respond to further calls and emails requesting comment by 2 p.m. Thursday. (UPDATE 11/17/17: Marshall Runkel called Friday to explain that he was in a bicycle accident Monday, in urgent care Tuesday morning and "struggling" to keep up with work obligations the rest of the week due to his injuries. He further explained that Eudaly's "after 5 p.m." comment referred to the email that Floum subsequently sent pursuant to her request.